If you were anywhere near a TV or radio or the Internet and checking the weather yesterday, you know about the cold front that moved through the midwest last night. That front is currently in New York. It's late spring and summer is next week. You'd have to be pretty dense not to realize that living in the mid-section of the country exposes you to some of the most rapidly changing weather on the planet. We get the cold air from Canada and the warm air from the Gulf of Mexico. When they meet each other, particularly in the spring, the churning dance produces some of the most violent weather ever seen. We choose to live here. As much as my knees acted up in March and April with the damp chill of spring mornings, I cannot imagine living in San Diego with weather that is uniform. It has its place, but it's not me. So, I'm attuned and have been for most of my life, to the changes wrought by the weather in the land where I choose to live. But yesterday's events brought something to the forefront of my mind, something that is not, I think, a positive. We have developed a "cult of weather", as I'm calling it. It started in the morning with announcements that thunderstorms with high winds and heavy rain would develop in the afternoon. Scientifically, we know this will happen because the sun heats the atmosphere. Heat rises where it meets the cold air of the upper atmosphere. The air doesn't have to be from Canada. Air temperatures at 30,000 feet up are not the same as in your back yard. We know what happens. We've known for decades. This mix breeds thunderstorms. But what we've seen, with the advent of social media and the ability to make movies with a cell phone, is the rise of the everyman storm chaser. Once the province of people of science, now the average person can hop in a car and, with a computer or just a smart phone, keep tabs on the National Weather Service's radar and warnings and The Weather Channel's on-air personalities pointing to green screens and making prognostications. You, too, can be rightthere, when the winds start circling and the funnel forms. You, too, can get your name and your video shown on the nightly news. We think this is normal and we are addicted to it. We want more. I followed the weather yesterday. I do want to be informed, make no mistake about that. If I had places to go last night, I would have wanted to know if heavy rain would have interfered with those plans. From Tuesday night onward, however, a graphic was sent around the Internet with the following information, "There is going to be a derecho Wednesday night that starts in Iowa and heads east. This weather event will impact 65 million people. Share this with those in its path." Huh? Last year, a derecho that formed west of DeKalb and roared east caused billions of dollars in damage. I was, at the time, in a movie theatre with Pam watching "Brave". The thing about this event was that it sprang up 45 miles west of me with little to no warning. Millions of people were inconvenienced and thousands were without power. What did we learn? That yelling the equivalent of "there could be fire" in this crowded country is the way to go. We demand immediacy and the talking heads about weather are our new prophets and preachers. Let me take a moment here and let out a heavy sigh. "Sixty-five million people are in the affected area." As yesterday went on, the rain predictions grew. Eventually, it was locally heavy rainfall totals of inches. 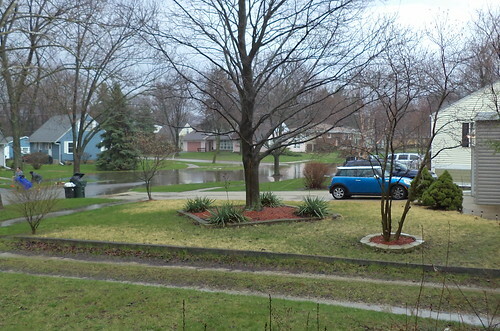 Back in April, we had an inches event that flooded the neighborhood and the street by the office. We knew the potential existed, at the time, for heavy rain. There's no place for inches of water to drain when it comes down in minutes. So the prospect of inches again last night made me check the house and yard and batten down the hatches. The garbage cans were shoved next to the deck. 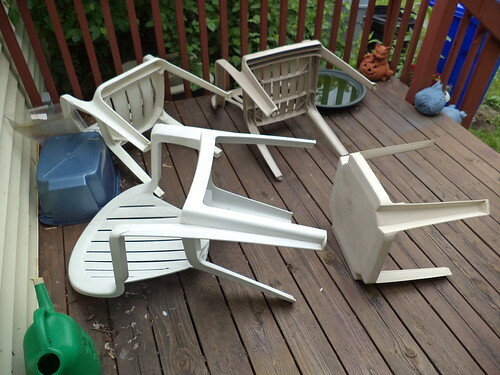 The flower pots on the front steps got moved off the steps to the ground and I tipped over the deck chairs to prevent them being lofted and tossed. In hindsight, as I was walking out my back door this morning and righting a couple of them to get off the deck, where they are isn't going to cause them to become airborne unless there is a tornado in my back yard. At the most, they would have been shoved next to the house or into the flower pots, but I believed the sentences about the forming of a derecho. I'm embarrassed. I believed. From March through November, professional and amateur storm chasers will fan out from Texas through Wisconsin, Colorado to New York, Oklahoma to Georgia, all trying to see the elusive weather phenomena known as a tornado. We will sit, glued to our maps and our talking heads, watching them tell us, in ever increasingly shrill voices, about potentials and probabilities. We will believe. We analyze their maps, hoping we can figure out what they, who may have years more training than us, cannot; just where the storm cells will "pop". We grab our cell phones and stand in our doorways with them aimed at the heavens, when we should be seeking shelter, hoping for that one bit of film footage that gets the Channel 4 News Team to interview us on camera. We. Will. Believe. Again, allow me a moment to sigh. The deaths of 3 professional and 1 amateur storm chasers in Oklahoma last month are now a footnote to the weather. I feel they and the manner in which they died have been forgotten in the drive to be in the right place at the right time. We have gone from, "This afternoon, conditions are right for strong thunderstorms with locally heavy rains and high winds to develop. Some of these storms could produce hail and may have the potential for tornadoes. Please check in with us and be prepared to move to a place of shelter should conditions deteriorate" to "OMG! ZOUNDS! 65 MILLION PEOPLE ARE GOING TO BE IMPACTED BY THIS STORM!" You know what my impact was? It rained. That's it. It rained. No high winds. No hail. Not even inches of rain. It was a cloudburst and then it went away. Pilchard was fine all evening. We had a few flashes of lightning but she never ran to hide. 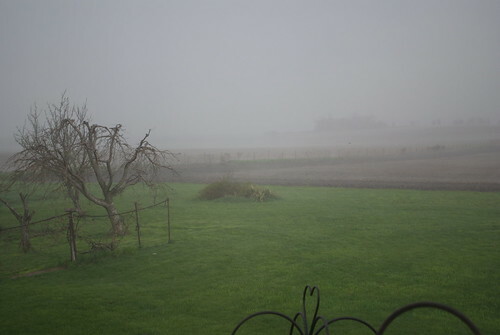 There were heavy rains and winds south and west of me. 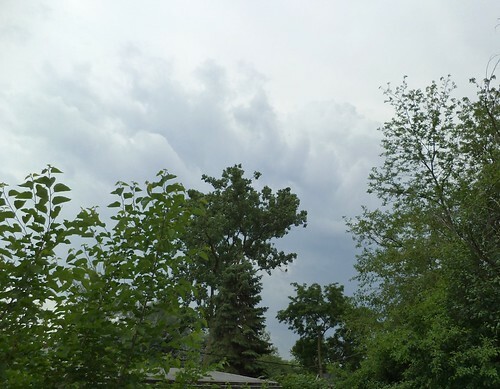 Tornado sirens went off in various Chicagoland communities. It was nasty in places out there. Increasingly, we are sounding alarms for potentials that never show, but we believe they will because we are believing what our prophets are telling us. We have developed, thanks to the awfulness of the past, warning systems that reduce death tolls from these major storms. This is tangible proof, life-saving proof, of what the early prophets, preachers, teachers and diviners worked to prove. I feel, however, that we have also removed the ability of people to make informed choices on the weather's impact. "Tut tut. It looks like rain" is now "Take cover! It could be the storm to end all storms!" The only thing missing is the running around waving our collective arms in the air. It's not quite Chicken Little, but it's so close. I am a very small voice calling for a return to reasonableness. I do need to know if conditions are right for the development of severe weather. I do need to know if that weather impacts me. I do need to know at what point to head to the basement. I don't need my senses bombarded with ZOUNDS! and OMG! and graphics in reds and purples. At some point, the weather will become the little boy who cried wolf. I hate to see the result of that. For the record, it's a beautiful day today, clear, sunny, mild. I didn't need the weather man to tell me that. I could see it when I walked out by back door. That's the way I felt today! Although a tornado did touch down near here, we didn't get any hail, strong winds or long downpours. Nathan was scared and so we all headed to the basement to watch the news and have him worry about where it was and where the tornados might be. And although we were home for last year's derecho, I only knew it was coming because a friend posted about it on fb. But, better safe than sorry, and better to say it missed us!